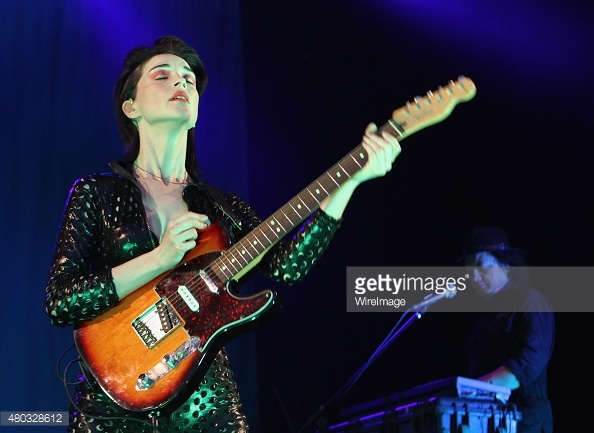 St Vincent arrived in the Iveagh Gardens on the back of the deluxe reissue of fourth album St Vincent, and played nearly all of it. Striding out onstage with slicked-back raven hair she was as alien a presence as David Bowie in his Ziggy Stardust phase, and began with ‘Birth in Reverse’ with choreographed dance movements (courtesy of Annie-B Parson) with her bassist Toko Yasuda, that only added to the otherworldly aura if you were far enough from the stage to not be able see her feet as she and Yasuda moved forward and back as if standing on treadmills. Climbing the large three step podium to deliver a triptych of songs before falling down into an inverse crucifixion pose there was also something of Gozer the Destroyer about the stage-craft, something that might please an artist who referenced Edward Scissorhands as an inspiration for the codpiece-flaunting black outfit with touches of grey, often bathed in red or green lights as it was for ‘Cruel’. After the opening salvo of ‘Birth in Reverse’, ‘Regret’, ‘Marrow’ and a vocally soaring rendition of ‘Cruel’ it was time for the first trademark rambling monologue, dismissing James Joyce as long-winded. And before she could be accused of the same crime she launched into her biggest hit ‘Digital Witness’, followed by ‘Year of the Tiger’, and then three songs delivered in a haze of dry ice from atop the podium – ‘Severed Crossed Fingers’, ‘Cheerleader’, and ‘Prince Johnny’. Standing near the speakers on the right of the stage it was noticeable from the off just how crisp and crunchy the sound was, rendering St Vincent’s material more electro-clash than you’d think. This was perhaps a pity for some of the quieter songs, but it rendered the opening of ‘Rattlesnake’, repeated over again while St Vincent danced, an unexpectedly juddering dance riff. After ‘Every Tear Disappears’ and ‘Chloe in the Afternoon’ St Vincent delivered another monologue, with a huge pause after talking about how much she shared with Dubliners, like her favourite Yeats quote, before deadpanning ‘There’s … so many, too many to pick just one…’ and launching into ‘Actor Out of Work’. ‘Teenage Talk’, ‘Bring Me Your Loves’, and a rousing ‘Huey Newton’ closed the set. Returning for an encore laid out like a body in repose she delivered ‘The Party’ lying down, before utilising the full depth of the stage and the front row for ‘Your Lips Are Red’ which turned into a full-on Led Zeppelin ‘Since I’ve Been Loving You’ solo-tastic improv-jamming freak-out. St Vincent played 9 songs from her newest album, all effective, and the two most reflective and subdued of them, played atop the podium, were highlights. St Vincent might have been better served venue-wise by a brace of Olympia dates, but she’s an artist at the height of performing confidence promoting an equally strong record.